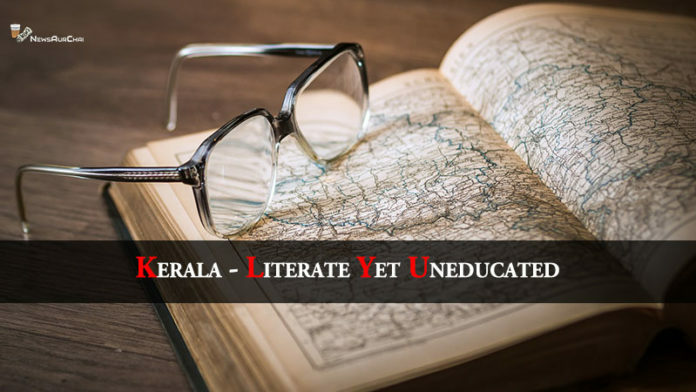 Different states of India are known for various reasons, like when I say Punjab, you think of Bhangra, Patiala suits, etc., when I say Rajasthan, Kathputli and Ghoomar comes in your mind and when I say Kerala, all you can imagine are the lush green landscapes and high literacy rate as if all intellectual people are living together in just one state. But this is not true, because literacy rate is just stats about education and providing education means making people sensible. For which, Kerala has ignored every chance to prove so. Recently Kerala was in the news for Sabarimala issue, and the news was not just about not allowing women inside the temple, but how who tried to enter were abused and beaten. Is this the way literate people behave? This is not just once when something like this has happened in Kerala, on the record, in 2016, a total of 16,960 cases, of crime against women and children, were reported in Kerala. In November 2018, a school in Malappuram suspended one of its teachers as he was accused of sexually harassing 19 children. This was not enough that recently a woman was starved to death by her husband’s family as her parents were not able to pay them 2 lakh rupees in dowry. Thushara, the victim who was only 27, died on 21 March and you’ll be shocked to know that she was not given food for three weeks and her weight was only 20 kgs at the time of her death. Neighbours are also accusing her mother-in-law of performing black magic on her. Providing primary education and giving degrees do not make people humble and sensible. Instead of just teaching them to read and write, they should be taught humanity and how to behave first. And this is not just for Kerala, the whole education system of India should include such things so that the crime rate can take a break and anyone can walk on the streets without any fear.